Located at the tip of the Malaysian peninsula, Singapore (officially the Republic of Singapore) consists of the island of Singapore and some 63 islets within its territorial waters. The main island is about 42 kilometres from west to east and 23 kilometres from north to south. It’s a mostly undulating country with low hills. Like most of Southeast Asia, Singapore is generally hot and humid. The temperature almost never drops below 20°C, even at night, and usually climbs to 30°C during the day. Humidity is usually over 75%. Located at the natural meeting point of sea routes at the tip of the Malay Peninsula, Singapore became an important port in the 14th century as part of the Sri Vijayan empire. It was known as Temasek (“Sea Town”), and trading and military sea craft from China, India, Portugal, and the Middle East visited it regularly. During the 18th century, the British saw the potential for Singapore to serve as a “halfway house” to nurture the merchant fleet of their growing empire, and as a location to rebut any advances by the Dutch in the region. For these strategic reasons, as well as their growing interest in the spice trade, the British established Singapore as a trading station. Singapore attracted merchants from around the world. By 1824, just five years after the founding of modern Singapore, the population had grown from a mere 150 to 10,000. Before the end of the 19th century, Singapore was unconditionally wealthy and trade exploded between 1873 and 1913. Singapore fell to the Japanese in World War II, and remained occupied for close to four years. The British returned after the close of war, but self-government was attained in 1959. Singapore was for a brief time part of a larger Malaysia, but in 1965 became a sovereign, democratic, and independent nation. Singapore now has a population of nearly five million. Totally urban, it is densely populated. The main ethnic groups are the Chinese (77%), Malays (14%), and Indians (8%). 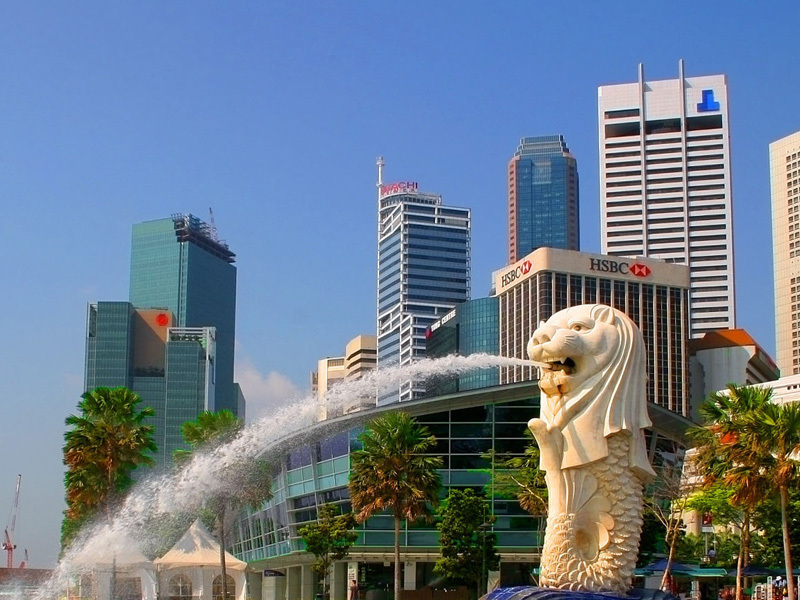 English, Malay, Mandarin, and Tamil are the four official languages of Singapore. Singapore is a cosmopolitan society where people live harmoniously and interaction among different races is amicable. The pattern of Singapore stems from the inherent cultural diversity of the island. The immigrants of the past have given the place a mixture of Malay, Chinese, Indian, and European influences, all of which have intermingled. Behind the facade of a modern city, these ethnic groups are still evident. The bulk of Singaporeans think of themselves as Singaporeans, regardless of race or culture. Known for how well run and regimented it is, Singapore provides an easy, safe, navigable, enjoyable experience for visitors and international students. Nightclubs, restaurants, and boutiques are among the most stylish in Asia, and the food is fantastic – sampling from all over Asia. Despite how urban it is, Singapore surprisingly offers many outdoor activities as well, including mountain biking, rock climbing, and water skiing. Singapore boasts the world’s second busiest port after Rotterdam, minimal unemployment, and a super-efficient infrastructure. Indications of how advanced and prosperous Singapore is come from the World Bank’s Doing Business 2010 Report: Singapore is ranked the easiest economy to do business in as well as the most open and liberal economy in the world. It is ranked the most competitive country in Asia, with the lowest levels of corruption in the economy. Singapore is incredibly international, which it has had to be given limited natural resources; the government welcomes foreign investment and the economic policy is export-oriented. The official currency is the Singapore Dollar. Singapore is a sovereign republic, with a legal system based on English common law. Its constitution lays down the fundamental principles and basic framework for the three organs of state: the executive, the legislative, and the judiciary. The prime minister is appointed by the president. The president, acting on the advice of the prime minister, also appoints other ministers from among the members of parliament. Singapore’s safety, low crime rate, and high standards of living are world renowned, offering international students an ideal environment for study. Leisure activities include sports, entertainment, and a range of fascinating sights and sounds to experience. The cost of living is relatively low, and basic items like food and clothing are very reasonably priced. An international student in Singapore spends on average about S$750 to S$2,000 a month on living expenses. This [KT5]amount, of course, varies depending on individual lifestyle and course of study. Originally based on the British model, the Singaporean education system has evolved to meet the needs of the globalised economy. It has moved from a fairly rigid orientation to incorporate emphases like personalisation of learning, advanced technology, innovation, and creativity. Its structure is quite complex, with students being “streamed” into different programmes/levels of study as soon as secondary school (four to five years), and then again streamed into different pre-universities[KT6] (two to three years) depending on their exam results and other qualifications. Students who don’t want to pursue university studies but do want professional qualifications go to polytechnics (three-year diploma programmes) or the Institute of Technical Education. The universities in Singapore often feature in lists of the top universities in the world. There are currently three local universities in Singapore. A new fourth local university will open its first intake in 2012. There are also foreign universities in Singapore which have either set up a physical campus (institutes of higher learning) or have joint collaborations/programmes with local universities (local tie-ups). The Ministry of Education’s Higher Education Division (HED) oversees tertiary and technical education in Singapore as well as registration of private schools. International students applying for admission to schools in Singapore have to provide documentary proof of having completed the age-based education level. In addition, institutions will normally conduct entrance examinations for international students in the subjects of English, math, science, and their first language. International students must apply for a student pass which can vary depending upon what is studied and where. The Immigration and Checkpoints Authority website (listed below) contains the correct information about student pass types and requirements, and how to apply.